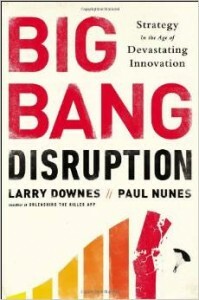 Book Review: Big Bang Disruption by Larry Downes and Paul Nunes : Executive Leader Coach @ dbkAssociates, Inc. This is perhaps the most fundamental challenge to our thinking. It used to be that we had time to respond to threats and the threats generally would not be both better and cheaper than the existing products. According to the authors, no industry will be left unscathed and no supply chain left unscrambled. 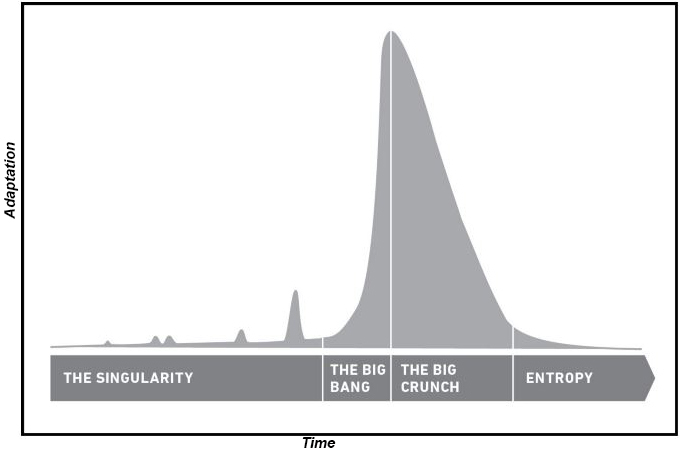 Most of us can think of a few examples of big bang disruption. One that comes to mind quickly is electronic books. The change has been both rapid and pervasive. Yet, that is only the tip of the iceberg. When we think of electronic books, we most often think of Amazon and their Kindle reader. However, the real disruption is in how Amazon has become the “Everything Store.” When looking at this change from a more global point of view the authors state that the one-way supply chain has been transformed into the ecosystem of Big Bang Disruption through three characteristics; undisciplined strategy, unconstrained growth and unencumbered development. Undisciplined Strategy: The Declining Cost of Creation. Steep declines in the cost of creating new goods allow innovators to compete on all three strategic dimensions at once. Unconstrained Growth: The Declining Cost of Information. Thanks to nearly two decades of advances in Internet technologies and networks, vast databases of information are being created for consumers by consumers, making it easy and efficient to search for any kind of information. Unencumbered Development: The declining Cost of Experimentation. Global broadband networks and ubiquitous computing devices connect innovators and users in an environment optimized for collaboration. The dramatic impact of declining costs in all three of the characteristics above is clearly visible in almost all of the many examples given in this excellent book. 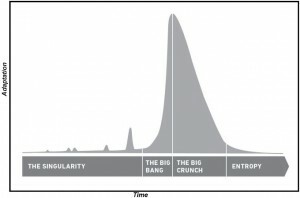 The authors continue their “Big Bang” analogy by describing the cycle as a shark fin shaped curve with the Singularity phase in the beginning, the Big Bang (an incredibly steep rise in product acceptance) followed by the Big Crunch (a bit slower decline of product usage) and ending in Entropy. Yet when the right combination of technologies is assembled and paired with the right business model, takeoff is immediate . Customers from a wide range of segments, including mass market consumers, adopt the disruptor as quickly as its producers can supply it. Market penetration is often nearly instantaneous. This is a very engaging and insightful book that, if the reader is not already convinced, will demonstrate why no business, even regulated businesses, can assume they will not be affected by Big Bang Disruptions.